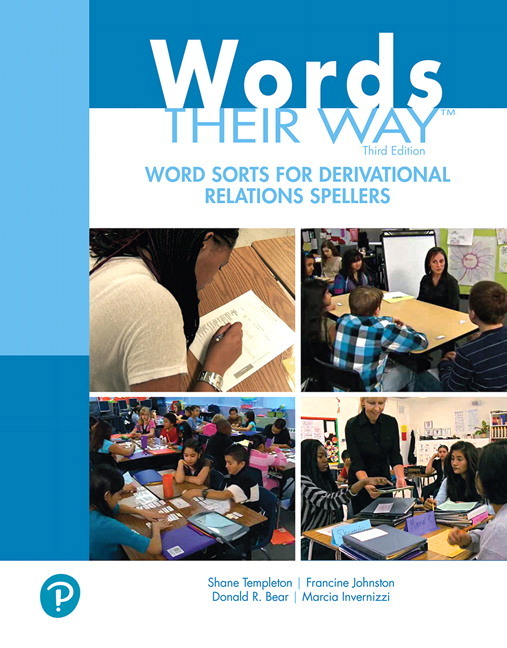 In keeping with the authors’ belief that the hands-on, word sorting approach to word study is invaluable to teachers and students alike, this volume presents prepared sorts and activities covering the full curriculum of word study for advanced readers and writers in the derivational relations stage of spelling development. Complete with 65 reproducible sorts, and dozens of other activities and assessments, this book provides all of the resources needed to engage in generative word study. Together, the Words Their Way core text and this supplement provide teachers with the knowledge and tools to meet the wide range of needs in today’s classrooms. The 3rd Editio n includes enhanced step-by-step directions for each sort, generalizations for each lesson, questions to facilitate critical thinking, support for English learners, as well as weekly and unit assessments. 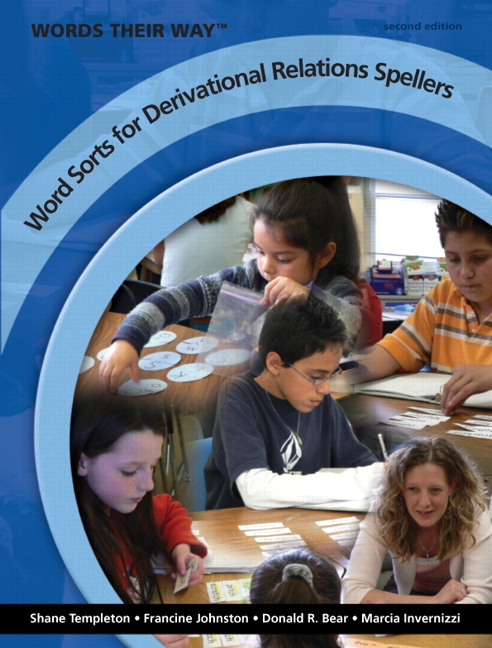 A complete curriculum of reproducible sorts and word-sorting activities for advanced readers in the derivational relations stage of spelling. Reproducible sorts—65 in all—are organized by basic and advanced levels into 12 units. Step-by-step directions include generalizations for each lesson highlighting what students will learn, tips for sorting and discussion, critical thinking questions, and opportunities to extend and apply learning. Generative word study engages students in the examination of the structure or morphology of written words and how the spelling of words visually represents meaning units, or morphemes—prefixes, suffixes, base words, and Greek and Latin word roots. UPDATED: Word sort lessons are now broken down into 7 sections: Generalization, Explore Meaning, Sorting and Discussion, Extend, Apply, and Additional Words. NEW: Clearly stated generalizations at the beginning of each lesson highlight what students will learn from each activity. UPDATED: Extend sections provide follow-up activities that go beyond sorting and involve students in word hunts, listening exercises, and more. NEW: Apply sections for each sort ask students to use the generalization to develop strategies for spelling unfamiliar words. English learners notes at the beginning of each unit provide guidance to teachers, including information on cognates and other related words. Weekly and unit assessments allow teachers to monitor student progress. Word sort lessons are now broken down into 7 sections: Generalization, Explore Meaning, Sorting and Discussion, Extend, Apply, and Additional Words. Clearly stated generalizations at the beginning of each lesson highlight what students will learn from each activity. Extend sections provide follow-up activities that go beyond sorting and involve students in word hunts, listening exercises, and more. Apply sections for each sort ask students to use the generalization to develop strategies for spelling unfamiliar words. Francine Johnston is retired from the Department of Teacher Education at the University of North Carolina at Greensboro where she served as Director of Graduate Studies, Coordinator of the Reading Masters Program, and ran a clinic for struggling readers. Francine worked as a first grade teacher and reading specialist for 12 years before getting her doctorate at the University of Virginia where she first learned about a developmental approach to word study and worked with Dr. Marcia Invernizzi to develop word study materials and activities. She consults with school districts across the country and frequently serves as a professional development speaker. Francine is a co-author of many books, including Words Their Way: Word Study for Phonics, Vocabulary, and Spelling Instruction . Francine, Donald, Marcia, and Shane are the core authors of the Words Their Way® series.